Here is a delicious, healthy and easy side dish recipe for you to try. Lucky for me I have an Italian father-in-law who loves to cook and has taught me this and other delicious recipes. This is an easy side dish recipe that you can even make ahead and then re heat when needed. I mentioned it is healthy and it is. 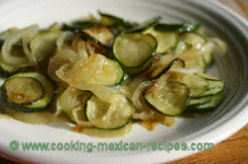 This sauteed zucchini recipe only contains 5 ingredients: zucchini, olive oil, onion, fresh garlic, and salt. Anytime you need a delicious vegetable side dish give this a try. I like to use a cast iron pan as it seems to add a good flavor to this recipe and the zucchini and onion brown up nicely. Add the olive oil and heat to medium high. When the pan is hot add the zucchini and onion. Cover with a lid. Stir after a few minutes or when the ingredients start turning brown. Add salt to taste. Continue to saute until the zucchini is soft and golden brown. When the zucchini looks like it’s done (the onion and zucchini have turned a nice golden brown all over) add the minced garlic and cook 3 to 4 minutes longer. You will notice a wonderful garlic smell fill the room. You can leave the zucchini in the pan and it will stay warm (one of the beauty’s of cast iron is it’s ability to retain heat and keep your meal warm). This side dish is excellent with spaghetti, roast, or any main dish. Enjoy. If you would like to check out another vegetable recipe, try my roasted vegetable recipe.